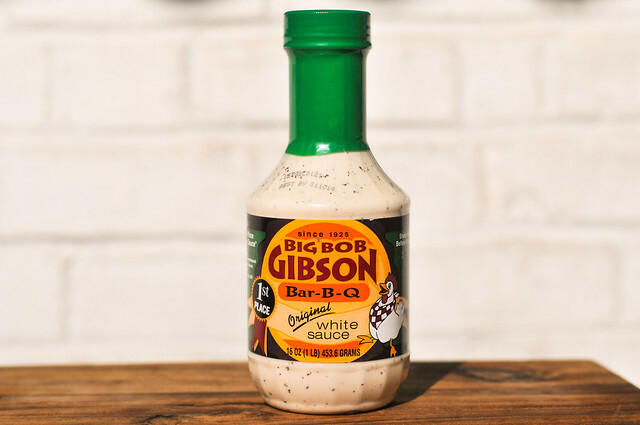 Bucking barbecue standards, this vinegar heavy mayo with a hit of heat enhances the texture and flavor of meat rather than masking it—that's the real magic of Big Bob Gibson White Sauce. Chris Lilly has brought fame to the Big Bob Gibson name as a champion of pork shoulder in recent years, but the legacy of this nearly 90-year old Decatur, Alabama institution is all in its white sauce. 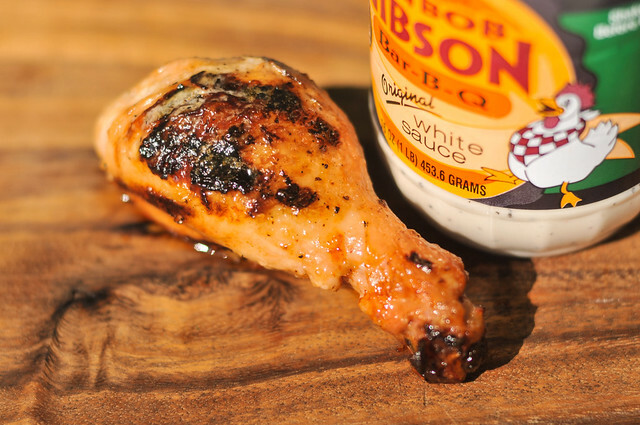 Robert "Big Bob" Gibson was the inventor of white sauce, "baptizing" whole birds fresh off the smoker in it before serving. Since then, it has become a staple and defining characteristic of Northern Alabama barbecue. 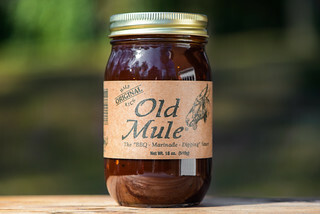 I got a bottle of this sauce from the source itself, being gifted to me as part of a trip down to Decatur hosted by the fine people at Kingsford. The aroma of this white sauce is closely akin to a super tangy mayonnaise, kind of like Miracle Whip or a potato salad. The vinegar pops more than anything else, and is only tempered by, for a lack of a better word, what can be described a "creaminess." There's some deeper elements at work as well—a slightly pungent mustard comes through and a faint hint of heat thanks to some black pepper. Weighing in at medium-thin, this sauce drizzles quickly off a suspended spoon with a thin layer of sauce left coating the silverware. 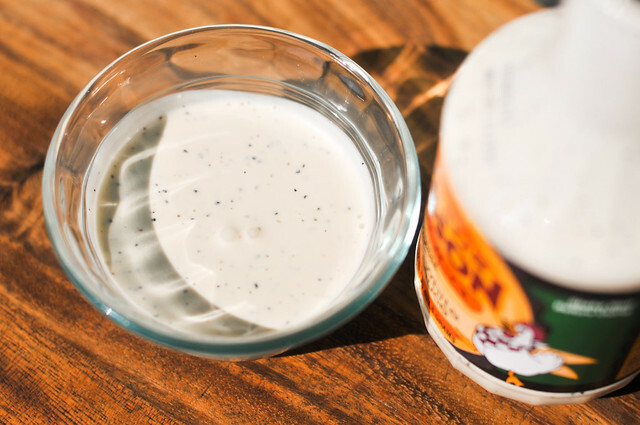 It goes without saying that "White Sauce" is white, but it also has a lot of specs of black pepper to give it more than just a thin and a smooth mayonnaise appearance. The taste follows the aroma almost to a tee. The main flavor is of a mayonnaise thinned with a whole lot of vinegar. Incredibly tangy and tart with a creaminess, it tastes like a really good dressing for a standard potato salad. 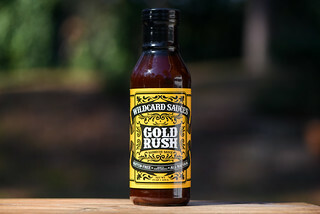 Mustard is a little more at play in the taste than smell, giving sauce a bit of a bite and being one of two elements adding in some heat—the other is black pepper. 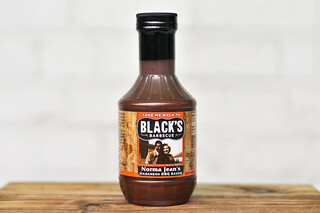 Ditching barbecue sauce convention, this sauce permeated the meat rather than sit on top of the skin. So the sauce more or less soaked in, rather than baked down, but still left enough sugar on the skin to allow for a little charring over direct heat. The magic of the sauce is in the nuanced way it changed the chicken. The leg had a mainly natural chicken flavor, but with an enhanced texture and slight tang that made the meat the best I've had in all of my barbecue sauce testing. White sauce is made to do one thing really well, make chicken taste even better. On the grill, I think that's the best way to use white sauce, but off the grill it can accomplish much more. Beyond being a great dip for light meats like chicken and pork, white sauce would probably serve you well as a dressing for backyard side standards like potato or macaroni salad. I really like this sauce, but at the same time that the vinegar and creaminess are attractive, there's also a slight chemically flavor. It's because of this that it's knocked down a place or two—if you take the time to make your own white sauce, you'll get something better than what comes out of the bottle in my opinion. You answered my question before I asked it - how does it compare to homemade. I've never had it from the bottle.